Last Sunday evening, a large number of faithful gathered in our beautiful Cathedral to pray the seven penitential psalms — prayers that have been used by the Church throughout the ages in moments of great need and sorrow. We prayed for those who have been hurt by the actions of the few who have so grievously betrayed their vows before God. We prayed that God’s abundant mercy and love would fill the hearts of those in most need. We prayed together for forgiveness and healing. The ceremony was very moving as well as consoling. I hope we can repeat such services in other churches throughout the archdiocese. But our prayer must be followed with action. In my column two weeks ago, I announced that I had ordered a review of clergy files by an outside firm. This is one of several important steps we are taking to meet four primary goals. Our first goal, and of greatest importance, is keeping our focus on creating and maintaining safe environments. In short, the protection of minors must be our top priority, and it must be what animates our every action and decision. Our second goal is to care for those who have been harmed by members of the Church. Our third goal is to facilitate the beginning of a healing process for our local Church in order to restore trust with the Catholic faithful, who are counting on the clergy and leadership of the Church to make virtuous decisions for the good of the Body of Christ. And, our fourth goal is to restore trust with our clergy, who are dedicated men and are deserving of our confidence and respect. 4. The prudent and ongoing disclosure of information as we ascertain all of the facts from a review of clergy files. You have my commitment that we will do what we have promised. Our actions will deliver the promise of our words. Over the last two weeks, since the publication of my column, I have received questions about the various actions we are taking and how they relate to one another. I’d like to address most of those questions here. There is also an article on this topic in this edition of The Catholic Spirit (see “Archdiocesan efforts seek to ensure comprehensive approach on issue of clergy sexual misconduct,”). I begin with the Safe Environment and Ministerial Standards Task Force. One of the things that this independent lay group will no doubt want to examine is the work that was done over the last year by a group of dedicated staff who, starting in the fall of 2012, looked at how the Archdiocese addresses clergy misconduct. This group did excellent work over a period of nearly a full year that culminated in the publication of their outcomes on our website in mid-September of this year. There are many fruits from their labor, including important changes to the boards that review and assess clergy misconduct on an ongoing basis. One of the most important outcomes of that group’s work over the last year was refocusing the Clergy Review Board, the longstanding group of clergy and lay leaders who assess all manner of clergy misconduct allegations, to concentrate only on issues potentially related to abuse of minors defined as violations of the “Charter for the Protection of Children and Young People.” We hold complete fulfillment of the charter as our top priority, and so the refocus of this group on this mission alone provides even greater resourcing and attention on this most sacred of trusts. Because of this change, the working group also recommended the creation of a new board called the Ministerial Standards Board. The mission of that group is to address “all else,” that is, any allegation of clergy misconduct that does not involve potential violations of the charter. By bifurcating the work into these two review boards, the working group sought to improve to a significant degree the process for review of cases and ensure that each receives the level of time, attention and investigation warranted. In short, more resources and a more-focused review and investigation were directed to these activities. All of this happened long before the media attention started about a month ago. So why do we need an independent task force if all of this good work was done just in the last year? There are three reasons: first, and most critically, because nothing is more important than protecting minors; and second, because we want a justly objective and independent body to bring specific and relevant expertise, experience and a fresh perspective to what we have done; and third, to demonstrate that we are truly doing everything we reasonably can to restore trust with the Catholic faithful. Having outside expertise and objective sets of eyes on all these elements will ensure we are employing best practices in this area. The role of the task force, then, is to review any and all issues related to clergy sexual misconduct and to make specific recommendations for actions to be taken and for policies and procedures to be implemented. The task force will be given all of the resources and access to documents as are needed to do its important work. The nature of the task force is to have a limited time scope and duration of existence; that is, when it finishes its work and delivers its final report of findings and recommendations, its work will be completed. The same is true for the review of clergy files by an outside firm, an action I ordered to ensure that we have not overlooked any inappropriate behavior from the past. While the file review began in earnest three weeks ago by outside counsel, we are currently interviewing firms to complete this work and I am confident that the staff members assessing the various candidates will soon select the best and most professional firm available. With a great sense of urgency, I am looking forward to receiving and ensuring the implementation of the findings and recommendations that will result from both efforts over the coming months. While the work of the Task Force and the file review is task-focused and each will have its own completion date, the missions of the Clergy Review Board and Ministerial Standards Board are ongoing. One of their most critical roles will be to implement the good work of the Task Force and whatever we learn from a thorough clergy file review. Ultimately, the outcome of all of these efforts — both those that are near-term and those with ongoing responsibilities — is to meet the four major goals I mentioned earlier. Nothing is more important than protecting the young and restoring trust within our communities. We have been given this sacred trust, this mission as disciples of our Lord and Savior, Jesus Christ. Jesus has given us the two great commandments to keep and live out with love and sincerity. And so I have made these firm commitments, and I am taking concrete and specific actions to fulfill those commitments with love and sincerity. My objective is to keep you apprised of the progress of these actions. You can count on my column addressing these topics in the months ahead. You can also look forward to ongoing coverage in the pages of The Catholic Spirit to provide more information and perspective on these most important priorities for our local Church. 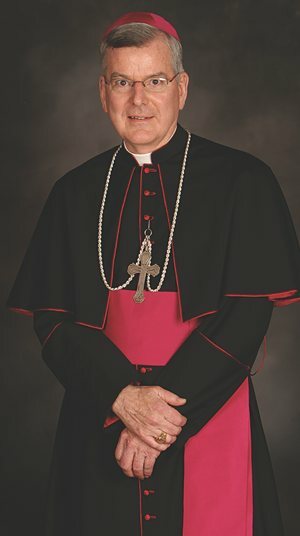 And while I continue to be deeply saddened at the pall that the events of the past month have cast over our Catholic parishes and organizations, I am determined to do everything in my power to restore your trust, so that we may indeed come out of this experience as a better, stronger and more focused Church. With unwavering commitment to our goals, with the concrete actions we are taking to fulfill them and with your prayers and God’s grace, I believe we will do just that. May the love and peace of Jesus Christ be with you and your families.